6 reasons to go to #SUNY Alumni Night at Yankee Stadium on 9/27, one that includes FREE tickets to a game next year! 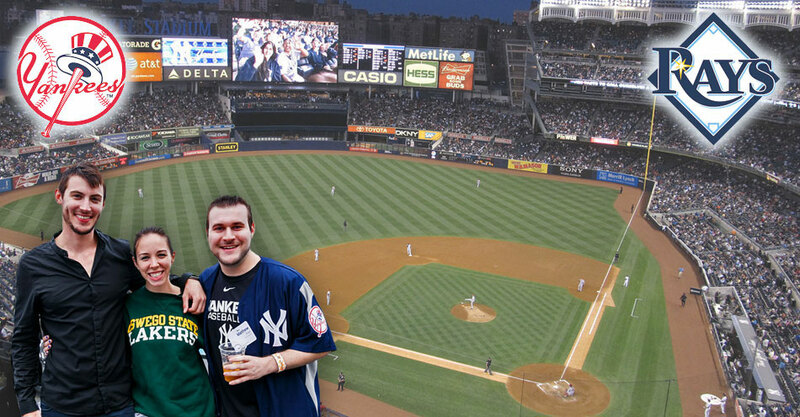 SUNY Alumni Are Set For An All-Star Night at Yankee Stadium. Are You? Grab your best jersey and favorite baseball hat because the 6th annual SUNY Alumni Night at the Ballpark is a great event for SUNY alumni to enjoy a fantastic night of baseball and networking with their family and friends! The push for the playoffs is on in Major League Baseball, especially in the American League, and we are excited on Wednesday, September 27th to root-root-root for the home team, the New York Yankees as they take on the Tampa Bay Rays! Whether you majored in biology or art, graduated in 1975 or 2016, there is no better way to network and meet members of our SUNY community than this annual event. We encourage you to take this opportunity to meet your fellow SUNY alumni members (we do have over 3 million!) and watch the Yankees march towards the playoffs. Be sure to come to Yankee Stadium with your favorite SUNY gear to represent your campus as SUNY fills the stadium. All are welcome to this event, so bring your family and friends along to watch some all-star athletes with some all-star alumni! All who purchase a ticket to SUNY Alumni Night at the Ballpark will receive a voucher good for 2 complimentary tickets to a select 2018 regular season home game at Yankee Stadium. Of course, there is plenty of quality baseball to see this night. Yankee rookie outfielder Aaron Judge is nearing a record for most home runs by a rookie. You might have seen him hit one 495 (!) feet earlier this year that passed over the outfield bleachers. Catcher Gary Sanchez is already putting himself in the same group as all-time Yankee greats with his power at the plate too. Enjoy a networking event from 5:30pm-7pm with all-you-can-eat ballpark fare and drinks, including beer and wine, in the all new MasterPass Batter’s Eye Deck at Yankee Stadium. After a fun-filled networking hour with your fellow SUNY alumni, everyone will make their way to their seats in the 200-level (perhaps with some new friends!) to watch the Yankees take on the Tampa Bay Rays. This fun event and excellent seats are available for just $89 per ticket! It’s a great way to meet other SUNY alumni and share your favorite SUNY memories. All you can eat ballpark fare, including beer and wine! You can bring family and friends to enjoy this great event in the Bronx at Yankee Stadium. Watch all-star talent that will be on the field, like Aaron Judge, Gary Sanchez, Luis Severino, Starlin Castro, and more. Show your SUNY pride! We love to see Yankee Stadium filled with SUNY colors for the whole world to see and this night is always perfect way to make it happen. All tickets purchased for SUNY Alumni Night at the Ballpark will receive a voucher good for 2 complimentary tickets to a select 2018 regular season home game at Yankee Stadium! Full details will be available at the game. You can find out more registration details and get your tickets here. It’s bound to be a home run and we can’t wait to see you there! Posted on September 22, 2017, in Events and tagged Baseball, Long Island, New York City, Reception, State University of New York, Suffolk County Community College, Yankees. Bookmark the permalink. Leave a comment.